With Australia’s Winter only days away my usual weekly ritual of slow cooking a piece of meat has turned into a twice weekly feast. I’m alternating between cuts that love a long time in the oven, like beef chuck or brisket, lamb shanks and pork neck or shoulder. 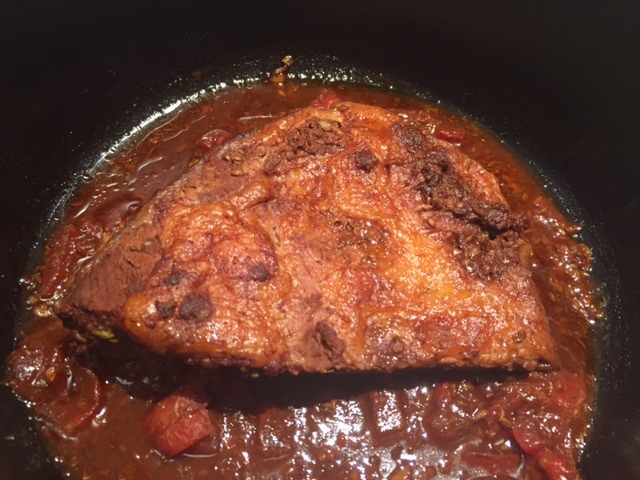 But, at the same time, I’ve got into a bit of a rut with the sauce base – red wine or beer, chicken or beef stock are my usual culprits. So this week when I received a couple of bottles of gorgeous balsamic reduction from Jomeis Fine Foods I decided it was time for a saucy experiment. I’ve always been a fan of top quality balsamic vinegar, even when it means paying four to five times more compared to the standard stuff. The flavour is so much better. 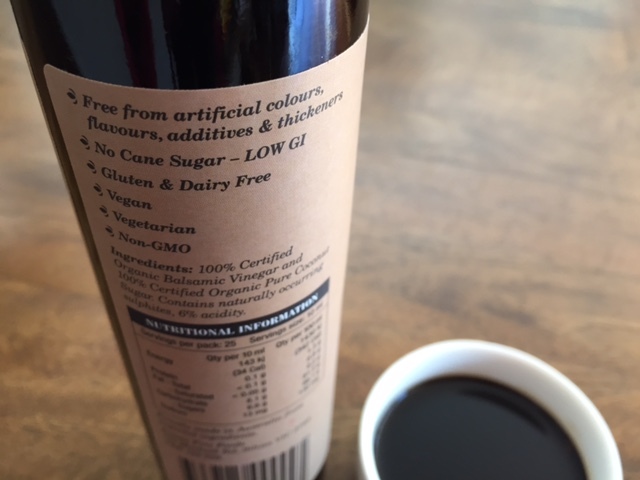 What I love about the balsamic reduction developed from Jomeis Fine Foods is that the products are made in Australia (yay to not transporting glass bottles 1000s of kms from Italy). Better still their sweet balsamic reduction is 100% organic and sweetened with coconut sugar, a healthier (lower GI) alternative to refined sugar. I’ve included a little more background on their products at the end of this post. 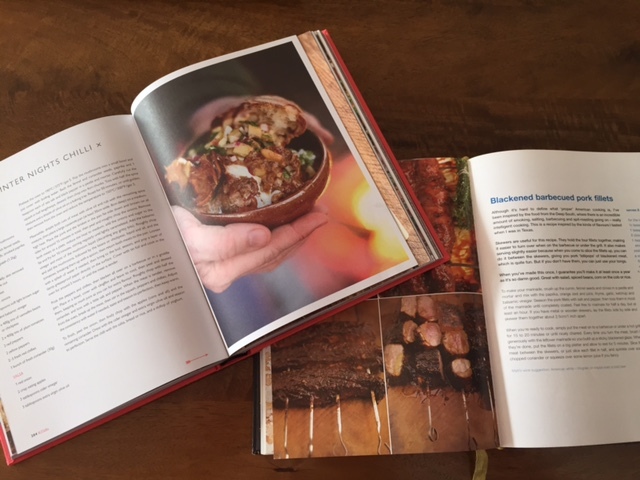 For this dish I took inspiration from my Jamie Oliver books – in particular his Winter Nights Chilli recipe from Comfort Food, and his Blackened Barbecued Pork recipe from Cook with Jamie. 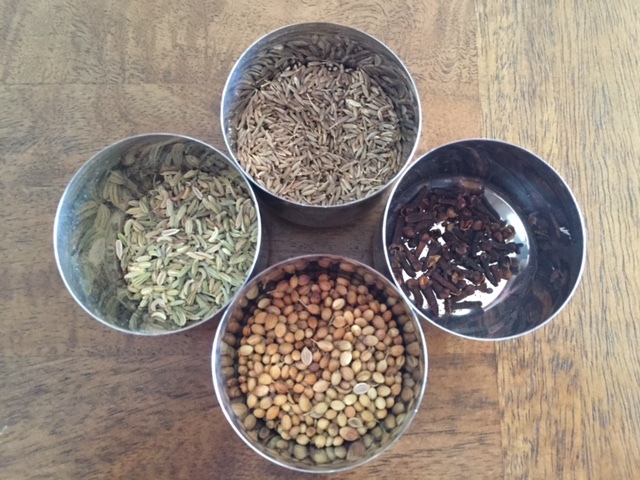 At home we use the term ‘Jamie style’ to justify the liberal use of olive oil or butter, or to excuse throwing in herbs and spices using instinct rather than measuring equipment. The recipe below is true ‘Jamie style’ on my part – so I’d encourage you to experiment with the quantities to find a mix that works for you. 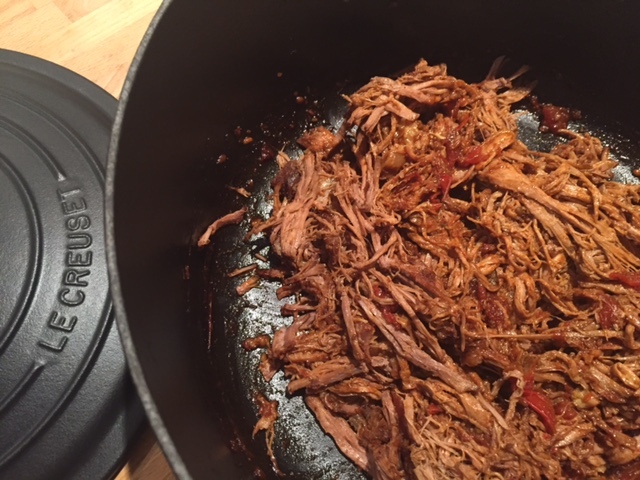 I called this shredded Winter weekend beef because it’s a perfect hearty Winter dish and the slow cooking time makes it especially suited to lazy weekends. 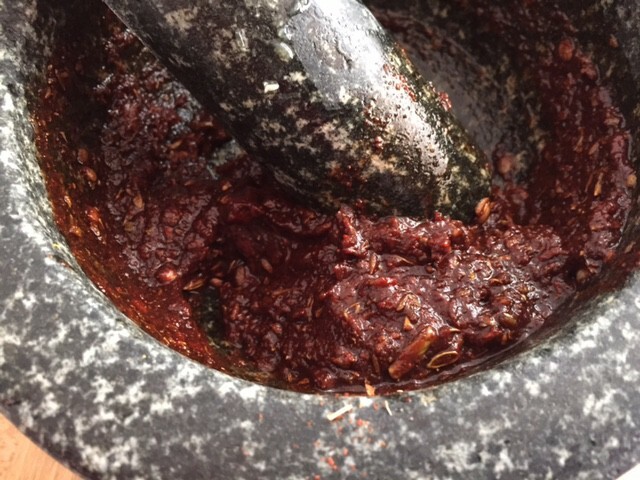 Ground all of the seeds and the cloves in a pestle and mortar. Add add the oregano and paprika, then the crushed garlic. Add the all of the remaining ingredients (except the meat & ripe tomatoes) and mix into a paste. 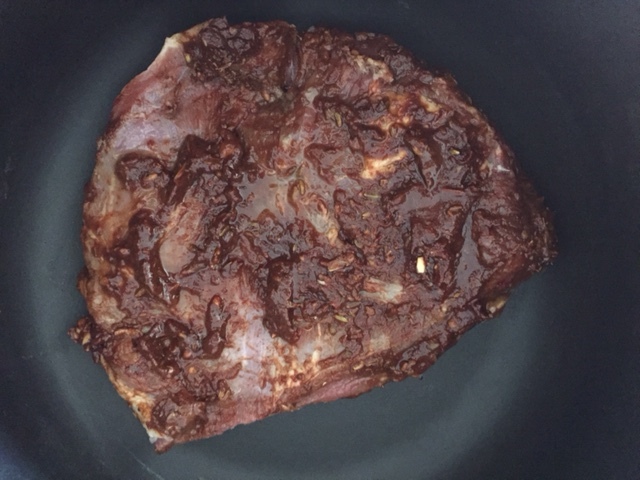 Coat the meat with the paste and marinade in the fridge for 2 hours (or overnight). Transfer the meat to an oven proof pot and add 1/4 cup water and the optional chopped ripe tomatoes. Cover the pot with a damp sheet of baking paper and then a layer of foil. Cook in the oven at 130C for 4 hours or at 160C for 2-3 hours. Half way through the cooking time baste the meat with the juices and add extra water if needed. Remove from the oven and allow to rest for a few minutes. Shred the meat with two forks. Transfer it back into the sauce and stir well. Serve with guacamole, cabbage salad and tortillas, or as a sandwich or burger filling with crunchy lettuce. Founders Vicki and Martin Nguyen combined their love of wholesome foods with their holistic professions including yoga and Chinese medicine to create Jomeis Fine Foods. Martin believes that so many sauces take away the true flavour of a dish, rather than enhance it. He discovered that many people found traditional balsamic vinegar too strong and acidic, so developed a reduction to create a sauce that aimed to accentuate the flavour of a dish rather than overpower it. 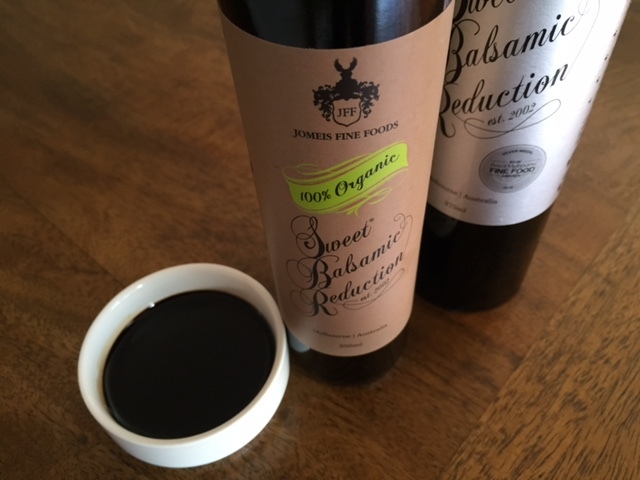 Jomeis Fine Foods recently launched a new version of their Sweet Balsamic Reduction – it’s 100% certified organic and uses coconut sugar. It’s the one I used in this recipe and can be enjoyed on both sweet and savoury dishes. 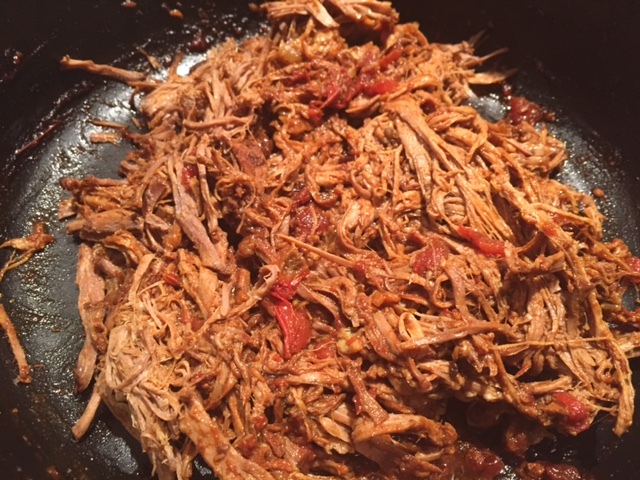 Tags: balsamic vinegar, beef, Jomeis Fine Foods, recipe, shredded, slow cooker. Bookmark the permalink. LOVE the concept ‘Jamie style’. I can relate! Coveting your cast iron le creuset! Thanks Joanna and yes the cast iron Le Creuset was worth the investment! This is a brilliant post. The recipe is fabulous and I can almost taste it with guacamole, cabbage salad or crunchy lettuce. Love all the herbs and spices you used and also love the term ‘Jamie style’. I’ll have to remember that! I can visualize this on the stove even in the spring/summer months. Especially serving it with cool slaw and tortillas. Thanks Seana – so glad you like it and of course please use the term Jamie style! It works well also with a fennel and apple slaw…. A great post! We’re in Spring here, but I’d still make this meat!!! Thanks yes I’d make it all year round too but the rich sauce makes it really suited to cold weather…. Thanks Amy – I’d love to know how it goes and yes it would pair really well with mashed potatoes made with plenty of butter! Have a great 3 day weekend! 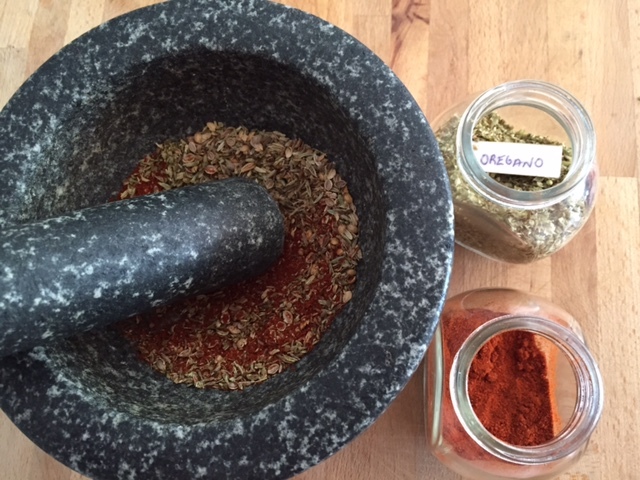 A great recipe – definitely one for the upcoming English winter! Thank you! Thanks Keith – don’t wish winter upon yourself too quickly!